This small tree is found in many sites on campus as it has become an invasive weed. It has been declared a class 3 weed. Seeds are bird dispersed. The pinnate leaves, to about 12 cm long, have 7-9 leaflets and the rachis is slightly winged. The small white flowers are in panicles on the outside of the foliage. 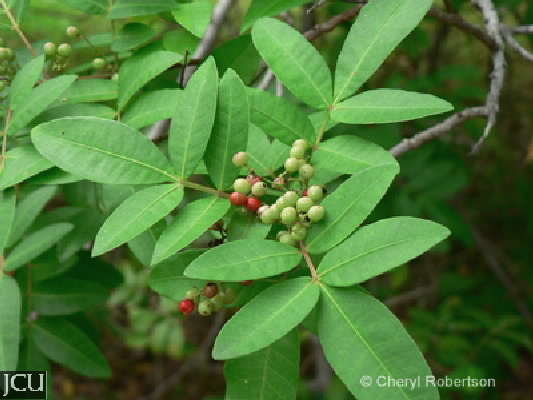 On the female tree these develop into large clusters of small shiny, red berries, not only beloved of birds but are also sold as the pink peppercorns of commerce because they have a resinous and peppery flavour. The resin present in these berries may cause gastroenteritis. In people who are susceptible, the pollen and volatiles, as well as the sap, may cause respiratory problems and dermatitis.